Ιn between Europe, Asia and Africa, there lies Crete and Rethymno, its hidden jewel. Rethymno and its region are rich in archaelogical sites, monasteries and churches, venetian villages and for-tresses. Blessed with scenic beaches and emerald blue seas combined with high mountains, deep gorges and caves, Rethymno offers plenty of adventure opportunities and a wide variety of sports ranging from scuba diving, sailing and surfing to biking and trekking. Dining can mean anything from casual cafes and local tavernas with native specialities to romantic gourmet restaurants, not to mention the exciting nightlife. Hotels here are proud to offer luxurious accommodation and conference facilities. Rethymno is easily accessible by airplane and ferry-boat. The Hotel DIMITRIOS VILLAGE BEACH RESORT and SPAIs situated in the very quiet Area of Missiria which is only approximately 2,5 km from the center of Rethymno and only a few meters from the sandy beach. The accommodation comprises of different Studios, double apartments and Suites, all with satellite connection, Telephone, Safe, Air-conditioning, Toilet, Bath and Hairdryer. All Rooms have Balconies or Verandas with a view of the Sea or the Swimming Pools and Garden. The two Swimming Pools plus a children’s Pool are close to the gardens, providing a relaxing Atmosphere for all one Guests. 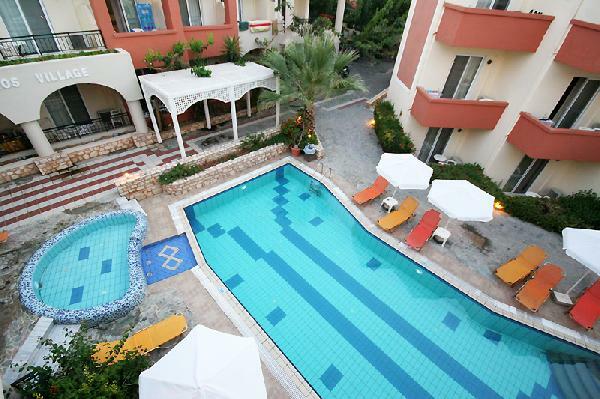 The Hotel is suitable for Families with Children and couples of all Age Groups. The Reception operates 24 hours a day make your stay more enjoyable. DOUBLE APARTMENTS: The apartments comprise of two separate room’s kitchen-sitting room and bedroom. Είστε ιδιοκτήτης ή διευθυντής στο DIMITRIOS VILLAGE BEACH RESORT & SPA; Εγγραφείτε τώρα για δωρεάν εργαλεία, που μπορείτε να χρησιμοποιήσετε για να βελτιώσετε την καταχώρησή σας και να συνδέσετε την ιστοσελίδα σας και το σύστημα κρατήσεών σας.